“Intolerance and racism will not go away without a concerted awareness and effort on everyone’s part. Regularly we must renew the commitment to drive it out of our hearts, our lives and our community,” the cardinal wrote in a letter dated Nov. 1, All Saints’ Day, that was addressed to the clergy, religious and laity of the Catholic Church of Washington. The letter from Washington’s archbishop comes at a time when racism issues and calls for racial justice have sparked protests on city streets, college campuses and even pro football fields across the country. “The mission of reconciliation takes on fresh emphasis today as racism continues to manifest itself in our country, requiring us to strengthen our efforts. We are all aware of incidents both national and closer to home that call attention to the continuing racial tensions in our society,” Cardinal Wuerl wrote. He cited the story of creation from the Book of Genesis and Catholic teaching in the Catechism of the Catholic Church on the equality and human dignity of all people. Racism, he said, is a “sin against our neighbor” that offends God and goes against the unity of the body of Christ, a unity that all Christians share by means of their baptism. The letter’s release coincides with the Catholic Church’s celebration of November as Black Catholic History Month. The cardinal noted how the “stain of racism” has affected people in every continent throughout history, often manifesting itself in marginalization, discrimination and oppression to indigenous people or newcomers. He noted that St. John Paul II in the Great Jubilee Year called for the recognition of sins committed by members of the church during its history. “The Challenge of Racism Today” is the 10th pastoral letter issued by Cardinal Wuerl as archbishop of Washington. Earlier letters focused on topics such as supporting and strengthening Catholic education: upholding Catholic identity in challenging times; finding a spiritual home in the church; sharing the Catholic faith with others; and relying on God’s mercy in the sacrament of reconciliation. 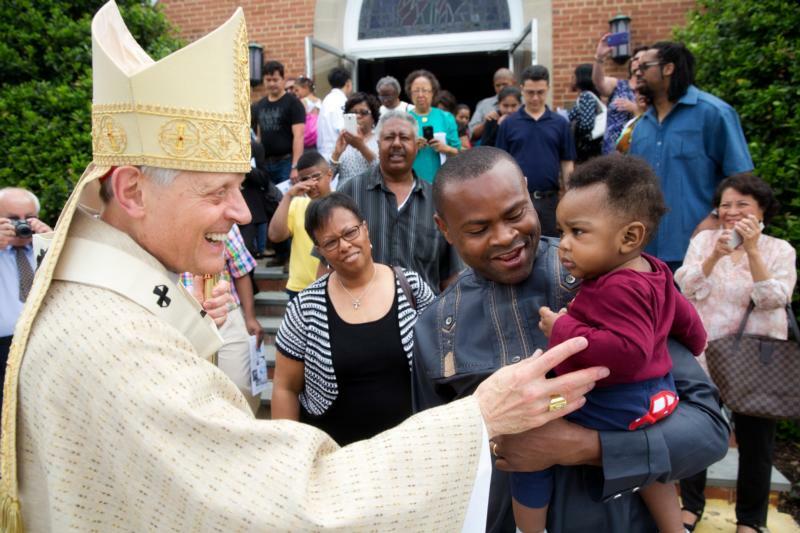 Cardinal Wuerl opened his new pastoral letter describing how he sees the diverse face of the Catholic Church as he celebrates Mass in churches throughout the Archdiocese of Washington. More than 620,000 Catholics live in the area covered by the archdiocese, which includes the city of Washington and the suburbs and rural countryside of five surrounding Maryland counties. He described the pioneering efforts of Cardinal Patrick O’Boyle. Soon after becoming Washington’s first resident archbishop in 1948, he began integrating Catholic schools in the archdiocese. This took place years before the Supreme Court’s landmark Brown v. Board of Education ruling in 1954 that outlawed segregated schools. Cardinal O’Boyle also offered the invocation at the 1963 March on Washington, where the Rev. Martin Luther King Jr. gave his famous “I Have a Dream” speech. Cardinal Wuerl said his pastoral letter underscored the Catholic teaching on racial justice and equality shared and expressed over the years by every archbishop of Washington. Cardinal Wuerl said people’s diversity enriches the Catholic Church and our world, and the response to Christ’s love should inspire Christians to work for solidarity. He said the archdiocese’s Office of Cultural Diversity and Outreach sponsors many Masses and other faith and cultural events to celebrate the diverse heritage of Catholics. Catholic Charities and the Spanish Catholic Center provide a range of services, and Catholic schools in the archdiocese educate children from all backgrounds. He also encouraged parishes to “follow Pope Francis’s example in promoting a spirit of dialogue and encounter with others,” by confronting the evil of racism and promoting unity and understanding through homilies, prayers at Mass, and parish programs and evangelization efforts. Cardinal Wuerl said the effects of racism on housing, employment, public education and the criminal justice system need to be addressed. Religious faith has an important role, he added, in confronting the key challenges of today, especially in standing resolutely for the dignity of all human life. Eliminating racism might seem “too great a task for any one of us or even for the whole church,” Cardinal Wuerl said. “Yet we place our confidence in the Lord. In Christ, we are brothers and sisters to one another. With Christ, we stand in the spirit of justice, love and peace,” he said.